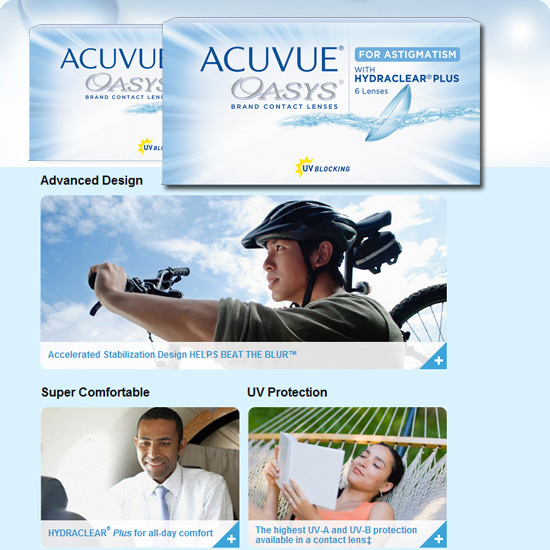 Acuvue Oasys for Astigmatism contact lenses combined the visual stability of a revolutionary Accelerated Stabilization Design and the exceptional comfort of HYDRACLEAR® Plus technology to form a lens like no other. The Accelerated Stabilization Design of the lens harnesses the power of the blink to create a lens that remains positioned correctly and gives you crisp, steady vision all day long. The result is consistently clear vision that's remarkably comfortable - It gives you superior comfort throughout the day even for people with an active lifestyle.